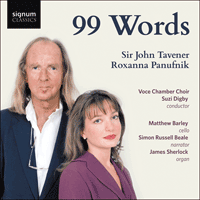 This album, a tribute to the life and legacy of Sir John Tavener, is built around his '99 Words to my darling children', first uttered at the composer's memorial service. 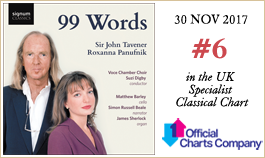 Roxanna Panufnik's setting for choir and narrator is one of several first recordings included here. This work was commissioned by Cricklade Music Festival with funds from Southern Arts. It was first performed at the Cricklade Music Festival on 1 October 1995, by the Kiev Chamber Choir with Steven Isserlis (cello), directed by Mykola Gobdych. The text is in Church Slavonic, and it is used at almost every Russian Orthodox service, perhaps most poignantly after the congregation have kissed the body in an open coffin at an Orthodox funeral. The choir sings as the coffin is closed and borne out of the church, followed by the mourners with lighted candles. The cello represents the Priest or Ikon of Christ, and should play at a distance from the choir, perhaps at the opposite end of the building. As in Greek drama, choir and priest are in dialogue with each other. Since the cello represents the Ikon of Christ, it must be played without any sentiment of a Western character, but should derive from the chanting of the Eastern Orthodox Church. When Dean Close School approached me to write an anthem to celebrate the launch of their new, exclusively made and exquisite organ I turned to one of my remarkably generous ex-English teachers (especially since I failed my English Lit O’ level) to find a suitable text. These verses from Dryden’s A Song of Saint Cecilia’s Day (1687) couldn’t been more perfect—the mention of various instruments are easily expressed in the new organ’s many sublime stops and the drama of the poem ideally suits such a versatile and expressive instrument. I would like to thank Dean Close for commissioning the piece, The Rt Hon David and Mrs Hicks Beach for supporting the commission and Alistair Langlands for introducing me to the delights of Dryden. The piece is dedicated to Dean Close School and lasts approximately 6 minutes. This commission was supported by the Ministry of Education and Culture in Iceland and is dedicated to Hilmar Örn Agnarsson and the South Iceland Chamber Choir. The work was first performed by the South Iceland Chamber Choir at Southwark Cathedral, London, on 15 November 2013. This set of Three Shakespeare Sonnets was one of the first works that I composed after serious illness in 2007. I wanted to pay tribute to my wife, Maryanna, who nursed me back to some degree of health, so I turned to the Shakespeare Sonnets. I was delighted to find that they brought forth music once again, after I had been silent for so long. Always having been an enormous fan of Sir John Tavener’s music, during a beautiful Service of Thanksgiving for his life and work at Westminster Abbey in June 2014, I was incredibly moved by his oldest daughter, Theodora, reading these ‘99 Words for my darling children, Theodora, Sofia and Orlando’. As well as being a deeply inspiring mantra for how he wanted his children to live their lives, there seemed to be so many parallels with my own personal history. Like Theodora, I had lost a composer father whose musical legacy is sometimes comforting but can also feel incredibly raw. Like Sir John and his wife Maryanna, I too have three children—two older girls and a younger boy. And these words sum up everything that I would wish upon my own children. My immediate reaction on hearing the reading was a desire to set them to music and just as I was writing to Maryanna to ask her permission, conductor Suzi Digby OBE, contacted me and asked if I’d consider setting them for her Voce Chamber Choir. The music I’ve written for this rocks gently, like a lullaby. The words are so important that I’ve made sure you hear everyone one of them by having them first narrated and then sung. The cello represents John—supporting, encouraging and embellishing the words. I have been longing to write for cellist Matthew Barley for a considerable time so I’m deeply honoured that he is premiering this. It is with enormous thanks to Maryanna, Theodora, Sofia and Orlando for letting me set these very precious words—I know it must have been a very tough decision and I am hugely grateful for their trust in me to do this. And thank you Suzi, for giving me the opportunity to do this. Proceeds from this recording will go towards the Tavener Foundation, which promotes access to John’s and other classical music, as well as harmony through music, between faiths. Threnos (Lament) for solo cello was composed late in 1990, for Steven Isserlis. The title, Tavener writes, ‘has both liturgical and folk significance in Greece—the Threnos of the Mother of God sung at the Epitaphios on Good Friday and the Threnos of mourning which is chanted over the dead body on the house of a close friend.’ Tavener wrote his Threnos to commemorate the death of a close friend.